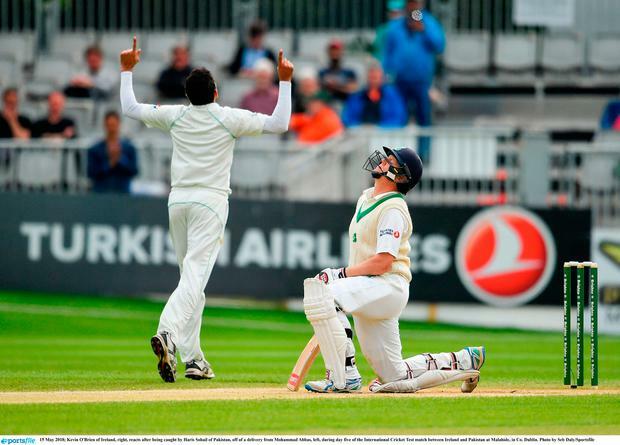 The unbeaten 118 O'Brien made on Monday raised hopes of the Irish drawing, or even winning, their contest against Pakistan in Malahide, but he was unable to add to his overnight score when he unnecessarily went chasing a wide delivery from Mohammad Abbas and nicked through to slip. Ireland needed to make early inroads if they were pull off an improbable victory and that is exactly what they got as Pakistan slumped to 14 for three. Tim Murtagh made the first breakthrough, with the fourth ball of the innings drawing Azhar Ali's edge, and Haris Sohail also found a fielder off Boyd Rankin's bowling. Murtagh then bowled Asad Shafiq to leave the home side ecstatic. Imam-ul-Haq and Babar Azam stopped the rot and the duo looked well-set when the tourists were 52 for three at lunch, needing 108 more for victory. Ireland, the 11th nation to play the longest format, were attempting to become the first country to win their inaugural Test since Australia did so in the very first Test in 1877. Furthermore, there have only been three previous occasions where a country have won a Test having been forced to follow-on - England in 1894 and 1981, and India in 2001.